Firm Hold Texture Paste. Get a thick head with Fat Hed. Watch it explode with shine, hold and texture upon application with a firm hold that goes all the way, all day long. Provides control and direction to hair. Creates root lift and volume. Adds texture to the hair. Very good website, great shop, genuine products, very fast dispatch and will buy again v soon, recommended shop on Internet! Love this product, been using it for a few years now, and if you have a sniff of it and let your mind wander back to the early 80's when the plasticine monster had eat up London town, and all the kids bought Chewits, it does smell like blackcurrant chewits! not plastic! any way, the product holds reasonably well, looks good, even with longer hair it still works well, I tend to use hairspray with it though, although I do with all styling products apart from really strong gels, which I don't like using anyway! So take my advice and go and buy some! This stuff is ok for hair of no longer than 2 inches. It doesn't have the same fudge smell, as mentioned in another reviews, and doesn't have the same hold factor. The hold factor is 9 on this product while Fudge Hair Shaper's hold factor is 10. 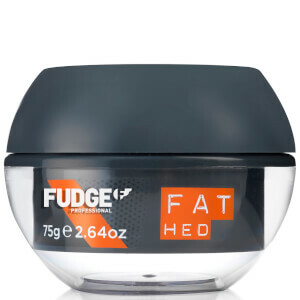 For longer hair (3-4 inches) I would get some Fudge Hair Shaper instead. Great product. Have been using it for years. Always thought it was a bit pricey though. Have just ordered some which arrived today and I've noticed you only get 75g instead of 100g so 25 per cent less. It's the same price but you get a lot less.I'm rating it so low purely because of the price. Surely if they reduce the amount you get the price should be reduced as well.